There are few, if any, restaurants on Sunset Blvd. I’d unbegrudgingly point visitors to. 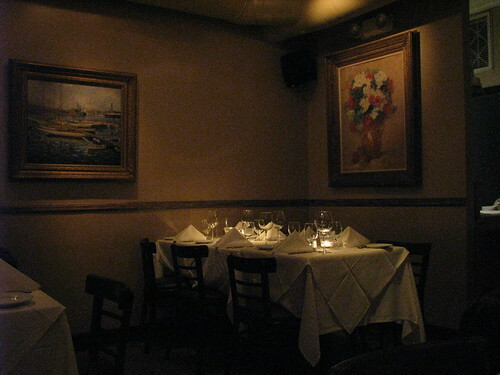 If they were looking for a home-cooked Italian meal – in Los Angeles, of all places – I might even suggest getting a Chicago or New York visit on the calendar. Il Sole is a place that would surprise anyone in both regards; it’s almost like knowing that secret Italian place on the infamous Sunset Strip. So obvious…so not. Ah, right. Cue to the press pages spread across the inside of the unisex bathroom – I remember, now. It was a far cry from my own experience one quaint Sunday night, however. I was able to snag parking on The Strip (Strip meters don’t charge on Sunday) prior to dinner and the restaurant was just halfway occupied by couples on dates as well as 6+ tops: group dinners and birthday parties. A comfortably dim yet festive vibe, carefully striking the balance between romantic and home family cooking. The dishes in their $35 prix fixe menu (one appetizer and one entree) are inspired by Chef Issac Rivera’s travelsÂ around Italy and the favorite dishes he chanced upon.Â On inspiration if not flat-out recreation: “It didn’t take too many tries,” Chef, a veteran ofÂ Chef Celestino Drago’s kitchen,Â confessed about his pumpkin tirimisu. Indeed, the experimentation continues and although there is a menu, Chef Issac stresses that it can be customized. So consult your server about your special requests and curiosities. 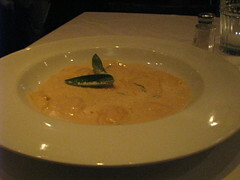 The pumpkin ravioli is a favorite at Il Sole, I’m told – and it’s not exactly hard to see why. It’s sweet, it’s savory – even almost like if you were to order it you decided to cheat with a rogue dessert before your entree. The problem was I always wanted the ravioli to be bursting with the filling since it was so good. But restraint is good as is delicacy so I decided it best to be patient. 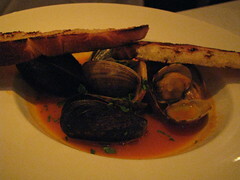 Another appetizer we got was the mussels and clams -Â with aÂ white wine-tomato based sauce. Delicious and indeed rustic – if a tad sour but complimenting the shellfish.